Wonderful line of north American fresh fishes. Small company, but great service. 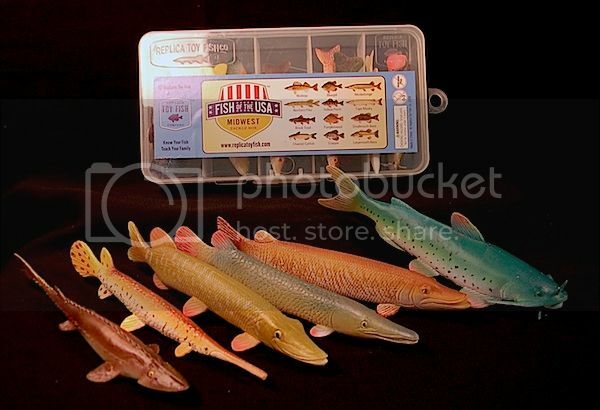 I do hope that they continue to make more, including some like the paddle fish and alligator gar. Also, would be cool if they made fishes from around the world also. the two size comparison. Small ones around 2" and larger around 6"
I said the same that in DTF: They are a jewels and I would like to have a similar collection . It is such a great line of fish figures! Highly educational and accurate. Getting the Gift Pack 1 was probably the best idea, because that's the set that covers all 18 different figures he's released so far (that's also how I bought mine). I really hope we'll see the new ones that have been planned for so long. No matter how long it takes, I'll buy them. Yes i Think the same. Is the first time that I see figures of a pike or a cat fish. I already had a pike (Bullyland) and catfish (Yujin) but these ones are extra cool--plus, made by a fish fan! Apparently the biggest issue has been the source manufacturer. But I still really want the gar set that was promised a year ago! Sbell, I would love to see that gar set too! Was there a prototype shown? I thought I remember seeing unfinished model of a gar before. Yes, there are some prototype photos on the facebook page of Replica Toy Fish. And a bowfin, too, among some others. I'd love to have them, too. Ditto that. And I'd like a Paddlefish too. Most likely one of the other keys to both success and future products for Simeon is selling existing material--therefore, anyone who has any interest in anything he currently has should support him by making purchases, or better yet, encouraging a local retailer to carry his products (and then, yeah, buy some)! I don't want to live in a world where we came soooo close to bowfin and paddlefish replicas and didn't get them! Absolutely! If I hadn't all of the current figures already I'd get them. All of them are very attractive and accurate, most of the species were never done before as a toy figure. I like his figures of smaller fish like Bluegill, Pumpkinseed, and Crappie, too and wouldn't want to miss them. And it's good that you brought the pictures up here. I forgot about those salmonids and the carp! For those who'd like to give a thumbs up for the Replica Toy Fish Company, here's the facebook site. Hehe, some of our members already did! Yes, there are actually two, a white one and a black one. Okay, shameless self-promotion, but at least we can all learn why we call the fish 'crappie'. Plus, you can all get into a peak at my psyche-through-writing, if you dare! Cool fish. I'm thinking about buying some from your store, how much would shipping to the UK be, for the Midwest Tackle Box? I will send a PM (I'm just responding here so that people don't think I ignored or missed your question!). I will mention that all of the RTF figures are 10% off right now, since I'm featuring them. It's great that you added the Replica Toy Fish series to your catalogue, Sean! And tyrantqueen, the Midwest Tackle Box is a good choice, it contains all of the small figures (so you just need the six large ones, too, and you're complete! ). Sigh, I wish those figures we've seen prototypes of were already available!